After the controversial freeze of seven EOS accounts last week, another freeze order has been issued by the EOS Core Arbitration Forum. But confusion reigns as block producer EOS New York releases a statement about a hoax order. One week after the controversial freeze of seven EOS accounts, there is again chaos for EOS. "It is hereby ordered that the EOS Block Producers refuse to process transactions from the following accounts and keys indefinitely. (Until further official notice and instruction from the ECAF.)" The ruling gives no details for the reasons for the order, but states "the logic and reasoning for this Order will be posted at a later date." Except for the addition of the phrase "verify order with trusted BPs before execution," the language is identical to the earlier freeze order from June 19. "This morning, 24 June 2018, EOS New York thought that a new ECAF statement had been issued. This new opinion statement was not a freeze request, but a request to ban accounts and move property. We had to 'ask around' to validate this statement because the author named on the opinion is unknown to us, there is no central repository of ECAF opinions, there is no official communication channel, and none of this is occurring on-chain. We later learned the statement was a fake, most likely doctored to incite further controversy." "Because EOS New York is unable to verify any subsequent opinion of ECAF in a transparent and secure manner on-chain, we cannot with confidence execute any subsequent statements claiming to be a valid ECAF opinion." 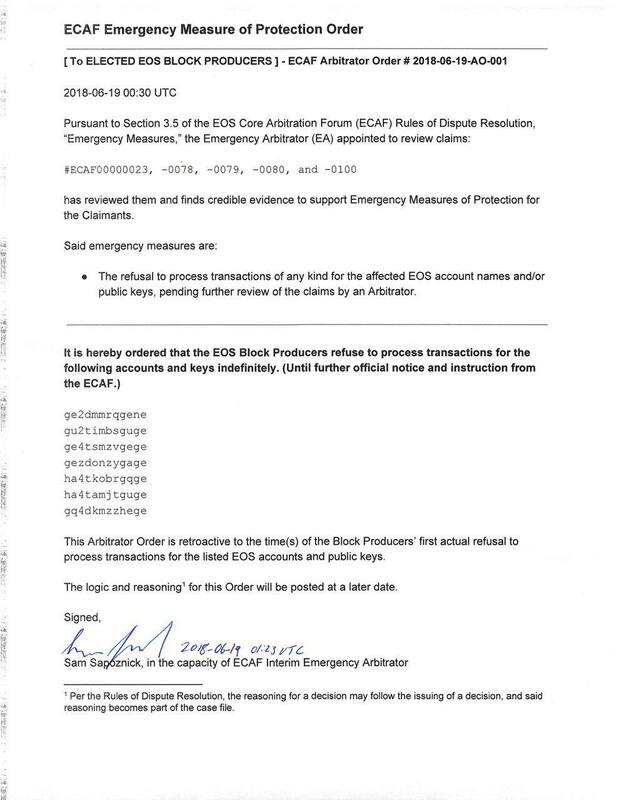 At the time the initial seven accounts were frozen, the block producers (EOS New York in particular) demanded ECAF step in to issue an order. Though the block producers eventually acted without proper authority, their inclusion of ECAF seems to be an attempt to maintain at least a semblance of due process. Prior to the June 19 order, ECAF wasn't sure it had the authority to issue emergency orders. Having issued its second now, it is apparently growing used to that role – a role it was dragged into by the block producers. Now, at least one of those same block producers is saying it might just ignore these orders in the future. Like what you read? Follow us on Twitter @ETHNews_ to receive the latest EOS, ECAF or other Ethereum ecosystem news.